We were asked at our Addiction Support group to prepare for consider when a habit becomes an addiction so I thought I’d consider this in a bit more detail. What I came up with was a personal road map for my journey to alcohol dependency. 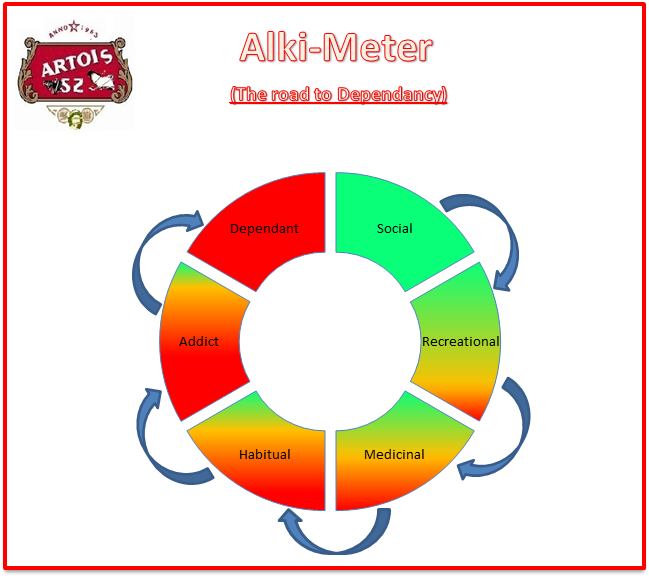 If anyone who reads this can place themselves anywhere beyond the green “social” drinker on the graph, now might be the time to start thinking. In the beginning I drank, as probably most people do, on social occasions. I dabbled first when I was young because everyone else was. I remember that, to start with, it was decidedly not a pleasurable experience; Being sick, the room spinning and storming hangovers the day after and I didn’t even like the taste. In fact we used to drink lager and lime to make it a bit more palatable. Then, when I was a bit older, it was just normal social drinking; the odd drink at lunchtime, parties and nights out - nothing out of the ordinary really. Then I started to enjoy the actual sensation of being drunk. Instead of getting legless being an unfortunate side effect of good night out, it became the purpose of the night out. Looking back, it was at this stage that I stopped being sick and finding the bedroom spinning when I tried to go to sleep and hangovers became much less severe. Personally I think this is probably the first warning sign. If you don’t get hangovers then your body is probably becoming more tolerant of alcohol which probably means that you are starting to drink too much - Just a theory. I also found that drinking calmed my nerves and gave me confidence at work doing presentations to large numbers of people. I’ve called this medicinal as I can’t think of a better phrase to explain it but it is drinking to deliberately to alter your state of mind. For some this might be calming the nerves for others it might be to cheer you up or to forget or escape from something that you don’t want to face. The next stage for me was that drinking became habitual. I think that a habit is something that you do so frequently that it becomes an ingrained part of your life and you start to do it without even thinking. You miss it, if it’s not there, but you don’t physically crave it. I started to drink nearly every lunch-time and always had a few drinks in the evening. It became the natural thing to do; get home, put the telly on, open a beer and relax. I think that addiction is in a completely different league from habit but the former does dovetail into the latter seamlessly without you noticing. Addiction is not just missing it when it’s not there, it’s physically craving it. It’s going into the shop on the way home and getting the beers first and then looking to see how much cash you have left for food. One of the warning signs that I didn’t take notice of was my increasing levels of irritation if, standing at a bar waiting to be served, if the barman took too long to serve me. It wasn’t just getting annoyed by the poor service, I needed that beer. In the final stages of my addiction I became physically dependant on alcohol and was officially diagnosed as suffering from Alcohol Dependency Syndrome. At this stage I simply could not function without a drink. In the mornings, despite the fact that I was probably still way over the drink drive limit, I would get severe shakes and sweating. The shakes were so bad some days it was difficult to even make a cup of coffee and using the computer was completely out of the question. I couldn’t deal with other people either. I even had to drink before I saw my own children so I would start drinking in the morning, feel ok for a while and convince myself it was just my nerves that made me shake. Then, beer in hand, I would assure myself that I would give up drinking tomorrow.